Come and See . 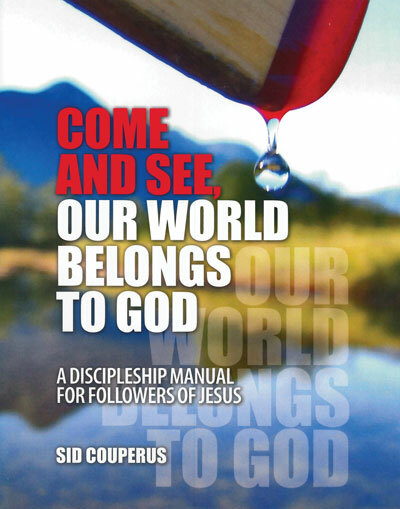 . . Our World Belongs to God is a discipleship manual that has taken the Contemporary Testimony Our World Belongs to God and divided the 58 paragraphs into 25 chapters. It is written and designed by Pastor Sid Couperus for high school students, new believers, small group, and follower of Jesus. Pastor Sid received a B.A. in philosophy from Dordt College and a Masters of Divinity from Calvin Theological Seminary. He began ministry in Guelph, ON and then moved to Abbotsford, British Columbia, serving for 17 years in Trinity Christian Reformed Church. During this time, he completed his Doctor of Ministry Degree at Fuller Theological Seminary, where he wrote Come and See...Our World Belongs to God under the guidance of Dr. Richard Mouw. He currently serves Mountainview CRC in Grimsby, ON. A few months ago he contacted, Syd Hielema, team leader for Faith Formation Ministries, about partnering with the CRCNA to make the discipleship manual available to other CRC churches. Each chapter of the discipleship manual begins with the Contemporary Testimony paragraphs, followed by “Encouraging Conversation” questions to stimulate dialogue and discussion. The second section includes a Bible passage with questions designed to explore the text. The third section serves as a one-page reflection on the topic at hand. The final section includes a spiritual discipline, a personal reflection, an action response, or a food celebration depending on the week. It's very encouraging to see local congregational pastors like Sid developing strong, Reformed resources to use with teens, adults, and new believers. You may purchase the book below from Faith Alive. How Do We Help Kids Feel Safe Again?